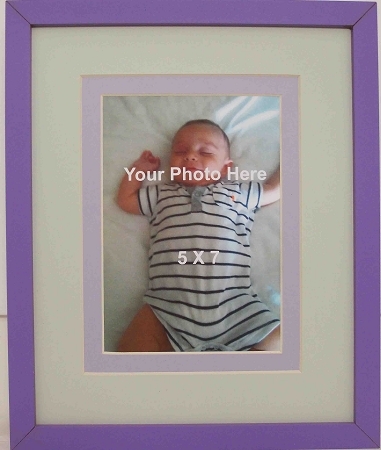 Light soft color palette of purple and light green wall mount frame hold a 5x7 photo. Remove all matting for an 8x10 photo. Unit includes a double mat of light green and violet mats with a 1/2 inch revel of light purple with a contrasting medium purple wood frame. May hand either vertical or horizontal, includes glass and wall hanging system.